COMING FROM EUROPE AFTER THE devastation of World War II, Willem Volkersz brought with him a rich history that is reflected in everything he does. 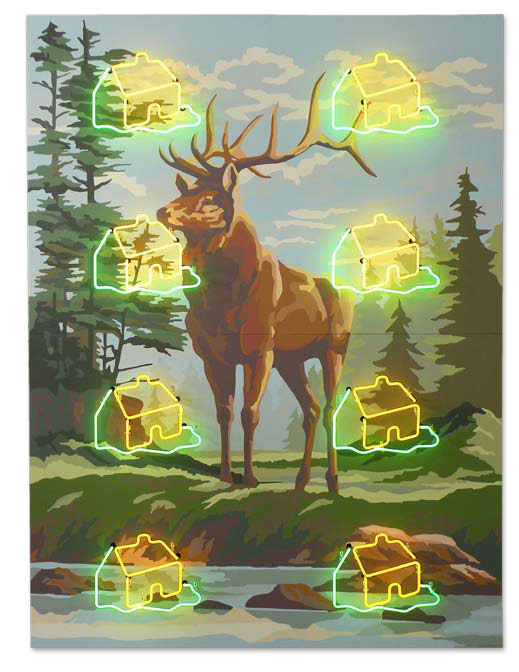 Volkersz’s work combines the quintessential American Dream with an outsider’s perception of attainment. 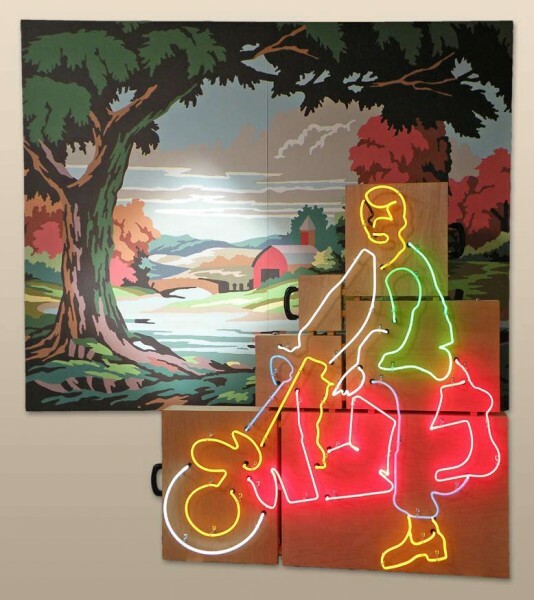 By using neon and kitschy found objects picked up at junk shops and second-hand stores Volkersz at once embraces our popular culture and forces a filter on Modernism. His most recent series is based on the Montessori school he attended in Amsterdam — a school he would later learn lost almost 200 children to the Nazi death camps. In 1941 the Nazis built a separate school for Jewish children and at that point they transferred out of Volkersz’s Montessori school. From there they were sent off to concentration camps in Auschwitz, Bergen-Belsen and Sobidor in Poland. By 1943 those schools were closed and Jewish children were sent straight to the camps. Volkersz began a series of pieces entitled In Memoriam that has been traveling around the area. 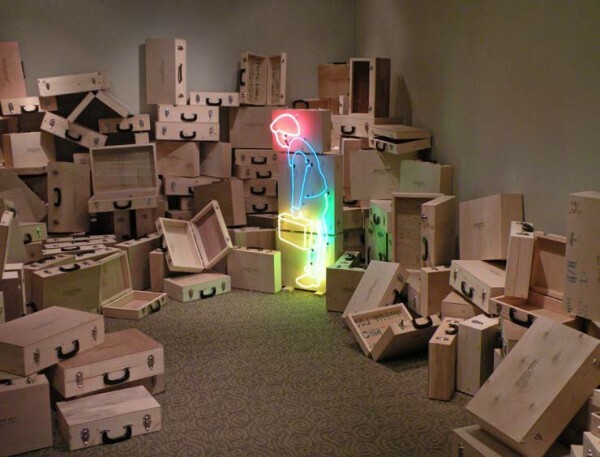 Surrounded by 166 wooden suitcases with the name, age, date and place of death of each student from the Montessori school, a solitary neon figure of a stooped boy carrying a suitcase in primary colors stands three-suitcases high — a ghost, a small soul, forever a transient in this world. The suitcases started as a metaphor for travel, but the more he thought about them, the suitcases became a metaphor for one’s journey through life. The wood used for the 166 suitcases in In Memoriam is recycled, picked up from the trash of a furniture store where Volkersz’s son worked — which gives the suitcases a feeling and look of having been used. It is also based on the fact that those who were rounded up and sent to the camps were allowed to bring a single suitcase of their personal belongings. Seeing all those cases, nearly identical, evokes a strong visceral reaction. Even though these atrocities happened 60 years ago, it still resonates. Twins, separated and sent to different death camps. “That look on her face was more than anything I could say,” Volkersz says. Ellen Ornitz, curator of the Jessie Wilber Gallery at the Emerson Center for Arts and Culture in Bozeman, will show Volkersz’s work in the early spring of next year. In particular the topic of the Holocaust. There are six or seven pieces in the Holocaust series, but in the end the work was so emotionally exhausting that Volkersz recently moved away from it for a while concentrating on his Paint by Numbers series. Small children’s chairs hang from an overhead beam — green, red, yellow — as if Volkersz is giving a lecture on flying in his studio. Postcards tacked to the walls under the rows of small windows and the few shelves house dozens of the kitschy porcelain statuettes he’s collected from junk stores and second-hand shops. On the far wall, a high shelf holds a dozen or more globes — which adds to the feeling of a classroom — in all shapes and sizes, the blue of the vast oceans stand out clearly from across the space. In a corner, suspended from pegs, are pieces of neon from projects past. The pieces he’s still working on is based upon four old paint by number paintings he came across in the shops. Combined, they form the idealized landscape of America: the mountains and fly fishing of the West, the farmland of the Midwest, a pink flamingo covering the Southeast and a Maine-like lighthouse forming the Northeast, fitted into an outline of the United States. 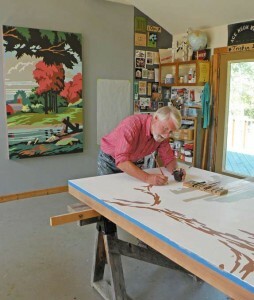 The piece is made of two quarter-inch birch panels that make up a 35- by 72-inch piece called Invasive Species. 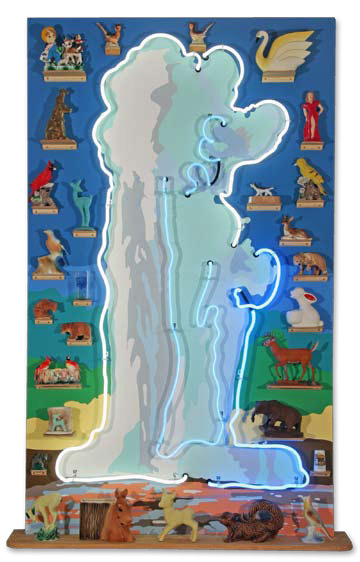 Along the completely black background, Volkersz included shelves that hold various found objects of ceramic birds, including a neon parrot with a martini glass. Coming to America and settling in Seattle during the early 1950s, Volkersz sees the country through the eyes of a perpetual immigrant — the American Dream in all its various incarnations. Part of that era was the iconic look of paint by number sets sold at dime stores and arts and crafts shops. Doug Turman, of the Turman Larison Contemporary gallery in Helena, represents Volkersz’s work and exhibited In Memoriam last winter. Volkersz usually does exhibit his work in museum settings, especially some of his bigger pieces. In Volkersz’s neon and found object pieces, he brings another subject to the table. By combining the symbols of postwar America with a style of art that assumes anyone can make a painting, Volkersz is in fact commenting on our present-day world. Because there is a simplicity to the images he uses, Volkersz runs the risk of appearing simplistic.